NB! Live Project is over for this time, but you can enjoy the exhibition, on of the outputs of the project. Creativity and Craft Production in the Middle and Late Bronze Age (CinBA) is a major new international HERA-funded project led by Dr Jo Sofaer at the University of Southampton involving partners in European universities, museums, heritage centres and the Crafts Council. The Crafts Council is the national development agency for contemporary craft and its goal is to make the UK the best place to make, see, collect and learn about contemporary craft. The Crafts Council is supporting the CinBA Project as a non-academic partner to bring innovative, international and interdisciplinary opportunities to the contemporary crafts sector. This project presents new and exciting ways to articulate the nature and value of contemporary crafts practice, primarily by exploring the role that the contemporary craft maker can play in archaeological enquiry, both as practice-based researcher-investigator and as interpreter of meanings within handmade objects. 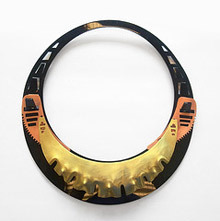 The CinBA Project offers important insights into the fundamental nature of creativity by exploring a part of European history not influenced by contemporary concepts of art – the Bronze Age – looking at developments in crafts that we take for granted today that have their origins in prehistory: pottery, textiles and metalwork. It also explores the potential impact these objects may have today as a source of inspiration and means of creative engagement for different groups, including contemporary makers. Within heritage and museum studies, much attention has been given to visitor experience but this has not included explicit investigation of how people today may find inspiration from engaging with prehistoric objects (the inherently valuable). This is important since it provides the basis for new types of heritage experiences in which creative potentials of objects are more imaginatively explored, as well as offering inspiration and new roles for the contemporary craft sector. The project would like to invite students of contemporary craft from a limited number of HE and FE institutions to become involved in the research in the academic year 2010-2011. Using Bronze Age objects as sources for their own research-based practice (focussing on motifs, design elements, complete objects, or a combination of these), participants are asked to create new contemporary craft objects. They are not limited to the media that are the archaeological focus of the project (ceramics, textiles and bronze) but are invited to develop ideas in other materials. Additional background on the project, a list of sources references and images of objects can be provided to course leaders by Dr Jo Sofaer, who is happy to visit institutions to give an introductory seminar to students on the Bronze Age and the archaeology of craft. Selected work will be exhibited in an on-line exhibition to be curated by Prof. Janis Jefferies, Goldsmiths University of London. This will be placed on the CinBA project website and also be linked to the Humanities in the European Research Area and Crafts Council websites offering international exposure for both institutions and students. The on-line exhibition will consist of photographs of the works created alongside design sketches, including any tracing the making process and inspiration. Submission for consideration in the exhibition will be through an on-line form to include: Dimensions, Title, Work Description (200 word limit), and Maker Statement (200 word limit) which should discuss the inspiration behind the new object. Good quality images of new objects and design sketches should also be submitted. Each image should be no larger than 9 x 12 cm (portrait or landscape) and 72 dpi at this size. Deadline for submission is 1st July 2011. Criteria for selection will include originality in design, quality of making, the clear articulation of inspiration by Bronze Age object(s) illustrated through the design process & the final piece, technical ability in use of traditional and/or new technologies. The exhibition will remain on-line until the end of the CinBA Project in September 2013. It will be archived as part of the CinBA Project in the University of Southampton open-access depository. Makers will retain all rights to their work. The CinBA Project will reproduce images and any submitted text for the purposes of the on-line exhibition and may wish to use these for promotional purposes.